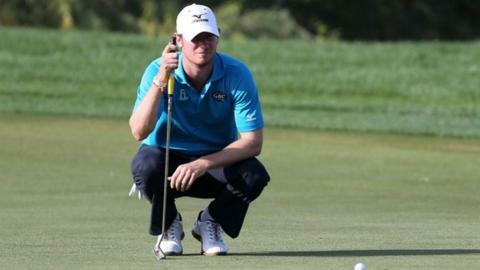 England's Chris Wood leads by three shots going into Saturday's final day of the Qatar Masters in Doha. Former PGA champion Simon Khan, New Zealand's Michael Campbell and Sweden's Alex Noren are in joint second on 12 under. Wood was fifth in the 2008 Open as an amateur before narrowly missing out on the play-off the following year. The Englishman, the current world number 142, had started the day two shots behind the quartet of leaders, Ryder Cup stars Sergio Garcia and Martin Kaymer, Australia's Marcus Fraser and Ricardo Santos of Portugal. The highlight of Wood's round was an eagle on the 548-yard 10th and having already notched up five birdies, an eight-foot putt lifted him clear of the field and there he stayed. Although he is chasing his first European Tour victory Wood did capture the Thailand Open last August.